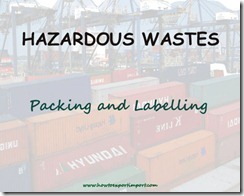 How to pack and label goods containing hazardous waste? What are procedures followed to pack and label hazardous wastes? The occupier or operator of the Treatment, Storage and Disposal Facility or recycler shall ensure that the hazardous waste are packaged and labeled, based on the composition in a manner suitable for safe handling, storage and transport as per the guidelines issued by the government agencies of importing country. The labeling and packaging shall be easily visible and be able to withstand physical conditions and climatic factors. Label containers as “hazardous waste” and list contents of the container on the Hazardous Chemical Waste Tag during accumulation. Alternatively, a “hazardous waste” sticker with general contents listed may be used until the waste is delivered to EHS for disposal. As a general rule, different wastes (solids vs. liquid, solvents vs. aqueous) should be accumulated in separate waste containers. This simplifies cataloging of waste constituents in a particular container, reduces the risk of reaction between incompatible wastes and avoids the costly disposal of complex mixtures. This guideline does not preclude the mixing of wastes that could obviously be mixed together, such as compatible solvent waste. Do not put liquid waste in plastic containers, as the containers tend to degrade and leak. Safety cans are mandatory for ignitable solvents and advised for halogenated solvents. Safety Cans springs must be in good working order (i.e. able to spring closed and stay tightly sealed) or the Cans must be replaced. Glass bottles are discouraged, but will be accepted from very small generators. Safety Cans do not have to be full to bring it to an Open House or for collection by EHS. Accumulate other waste streams (acids, metals, etc.) in separate containers. Solvents should be free of all other wastes, including aqueous wastes and water not mixed during the same procedure. The above information provides a basic idea about packing and labeling of goods containing hazardous wastes. You can share your thoughts about packing and labeling hazardous wastes. 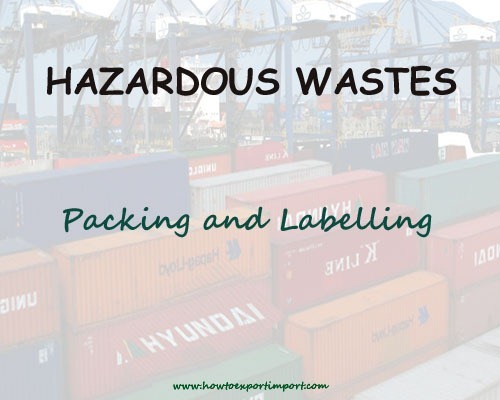 Add below your thoughts about packing and labeling of products containing hazardous wastes, as a part of import process.